Back to the 68/69 series that this blog runs for about a year now. One of the most famous singles of late summer/early fall of 1968 is hardrock heavy metal classic 'Born to be wild'. But what is the album like? When I'm honest here, I do not think to have ever heard another song by Steppenwolf, just this one. The one that charted three times in The Netherlands, in 1968, 1973 and 1990, when it finally became a top 5 hit over here. Other albums that came by in the past months were e.g. by Barry Ryan, Donovan, Spooky Tooth and Blue Cheer. Steppenwolf is, yes it still exists, although the band hasn't recorded since 1990, a band of Canadian origin, that moved to Los Angeles where they recruited the final two members to go on their way to fame. John Kay, the singer/guitarist, is the only remaining member of the original line up. The rest of the band consisted of Rushton Moreve on bass and backing vocals, Michael Monarch, guitars and backing vocals, Goldy McJohn, keyboards and Jerry Edmonton on drums and backing vocals. Steppenwolf was released in January 1968 and is a fairly exemplary album for the time of day. Psychedelia left behind, rock and roll influences with the first hints of a harder rock in which The Rolling Stones would soon lead. Steppenwolf beat them to it as I'm hearing at my first listen session. It took me no problem to listen through Steppenwolf at all. Why did it take me so long before I ever checked the album out? That's the main question I'm left behind with. There's no answer, is there? Considering that this is a debut album, my conclusion is that Steppenwolf is a mature album, that in its sort easily stands the ticking of time. It's solid, rocks out and plays the electric blues the U.S. bands had discovered around 1967. Of course Muddy Waters is covered, 'Hoochie coochie man', in an overdrive version and Chuck Berry is tipped the hat at in 'Berry rides again'. A load of titles are bundled together in a whooping rock and roll song. Covers are all fine of course, but what I noticed straight away is that Steppenwolf was able to come up with some very interesting originals as well. Compared e.g. to Blue Cheer, Steppenwolf wins this easily. And when the band couldn't come up with its own song, then there was Mars Bonfire, the alias of drummer Jerry Edmonton's brother Dennis. (And Edmonton was also an alias to make things a little more complicated.) He brought the band's best known song to this record, 'Born to be wild'. Probably I would never have heard of Steppenwolf were it not for this great rock song, with the famous line "Heavy metal thunder". Steppenwolf also reminds me of another record I reviewed in this 1968-1969 series, 'Joe Cocker'. Would he have sounded like he did without this record? A good question, as there are several similarities that are striking. Opening song 'Sookie sookie' could have been on Cocker's album easily. It is obvious that Steppenwolf is searching for its own identity on its first album. There are hints of the sound with which Jefferson Airplane had broken through in 1967, a version of the blues of Hendrix and Cream of 1966-67, but also songs that hint at things to come. Songs that would get known as hardrock or anno 2014 classic rock. Fronted by a singer with a distinctive voice, rough edged without overdoing it, a raucous guitar supported by warm organ sounds or piano. Steppenwolf finally also convinces in a rock ballad, 'Desperation'. Adding it all up, I have certainly found myself a new, old favourite album. Steppenwolf is a great rock album, that underscores the quality of that one hit single 'Born to be wild', the song the band will forever be remembered for. A song that is one of the staples of classic rock's history. The song which everyone of my age and older associates with two hippie bikers. 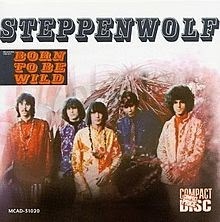 Steppenwolf is an album to check out if you're into 60s rock and haven't heard it yet. They do not get much better, believe me. You can listen to 'Born to be wild' here.